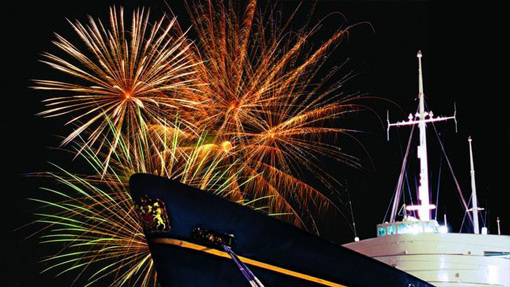 The Royal Yacht Britannia was home to Her Majesty The Queen and the Royal Family for over 40 years, sailing over 1,000,000 miles around the world. Now berthed in Edinburgh, the Yacht is a tourist attraction where you can follow in the footsteps of Royalty to discover the heart and soul of this most special of Royal residences. providing a truly unforgettable evening. 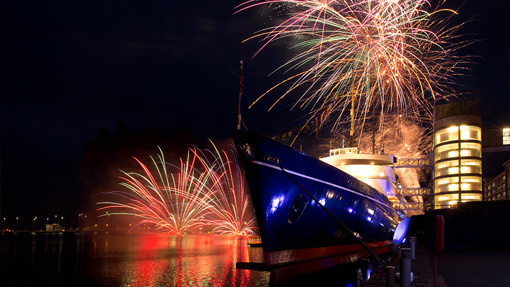 We have supplied Firework display’s to the Royal Yacht since the turn of the century and used to fire from an open headland located adjacent to the Yacht. In recent years a large apartment block was constructed on the firing site, which prevented us from firing anymore shows, so we had to find a new firing site in which proved to be very difficult in an area with so much water as well as a large Shopping Centre. After several exploratory meetings and conversations with local land owners we were left with only one option a small path of land at the stern of the yacht. Due to the close proximity of the firing site to the viewing area on the stern of the Yacht we had to alter the design of the show. We utilised the large expanse of water and turned it from an obstacle into our advantage. Rather than firing products vertically, we altered the firing angle to direct product out over the water and used that as our safety (fallout zone). A spectacular display, fit for a Queen. The guests benefit from a raised view platform so rather than having to arch their necks to watch the display it literally happens right in front of them. We also use specialist AQUA Products in the display which are fired out onto the water, they land and float on the surface of the water. When they explode the water acts like a mirror creating for some incredible images.